Larry Blevins and Wade Barnett repair tire chains that keep park vehicles from sliding on the road. 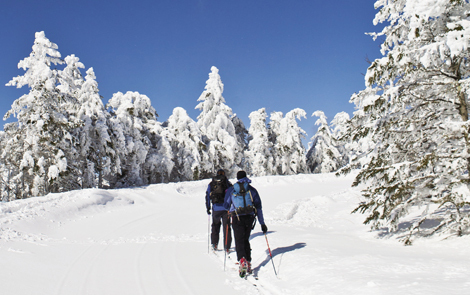 Matthew Brown reaches for the essential gear of winter: snowshoes. Larry Blevins ladles steaming soup during the Mardi Gras meal for rangers and park staff. what serious skier wouldn’t grin before starting a run from the summit tower of the East’s loftiest peak? The park’s front-end loader takes a bite out of winter on its way to clearing the summit road. In addition to claiming the East’s highest peak, Mount Mitchell was the first state park in North Carolina. Larry Blevins scrapes away snow to dislodge a frozen door on a gear shed. snapped out of gleeful adventure mode into wary silence. We’d suddenly realized at once that the alpenglow on distant peaks was sunset. Darkness was quickly descending upon this meadow on Mount Mitchell, but we’d been so enthralled with 10 feet of epic snow and Colorado-like telemark ski conditions that none of us had noticed the light waning until now. My friends zipped off across the meadow to the cars we’d left near the state park’s closed and snowbound restaurant. I started after them on snowshoes, but then calculated that darkness was only 15 minutes away. There was no way I could keep up with the skiers on the easy route back to the road. To avoid spending the night in the woods in near-zero temperatures, I had one available course—straight up. Here, there is no predicting the weather, especially in winter. At 6,684 feet, Mount Mitchell reigns extreme. The peak boasts North Carolina’s coldest weather recording station—even situated 444 feet below the summit—with an average yearly temperature of 43.8°F. The state’s lowest temperature of -34°F was recorded here in 1985. And from December through February, the average temperature is below freezing. As low as the mercury drops, the snowfall climbs, with an average of more than 100 inches a year—greater than Buffalo, New York. The state’s greatest 24-hour snowfall occurred on Mount Mitchell in 1993—36 inches. Put a yardstick by your driver’s side door (while imaging a shovel) to appreciate it. North Carolina’s biggest single snowstorm occurred from March 12 to 14 the same year, and dumped 50 inches on the peak. Forget the yardstick—your car is a bump in the snow. With this severe climate, it’s no wonder people who slog up Mount Mitchell on snowshoes and skis take comfort in the fact that the peak is continuously populated by park staff. The road to the top is open during long stretches of fair weather, particularly during milder winters, but serious mountaineers often focus on the snowiest, and thus stormiest, times to explore the mountain. Last February, I got a taste of the staff’s Canadian lifestyle. I managed to finesse an invitation for myself and some cold-weather freaks—I mean friends—to come up and take advantage of awesome winter recreation conditions for three days. There’s something about unlocking the gate at milepost 335 on the Blue Ridge Parkway to start the 16-mile drive up Mount Mitchell that puts butterflies in your stomach. We drove through the gaping mouths of tunnels fringed with icicle teeth threatening to chomp our cars in half. Through swirling snow, we went from dry pavement to a snow-packed trail, the landscape changing from deciduous trees to snow-bombed evergreens that looked like shivering ghostly giants. At the top, we jockeyed for a parking space in gale-force gusts. Only by sheer luck did I avoid having my car door ripped off by the wind. Later, a park maintenance staffer told me that door dislocations happen a lot. Ranger Matthew Brown greeted us at the maintenance area, a cluster of garages, staff cabins, and communal barracks that looked like an Antarctic research station. “You must have good karma with mountains,” he said, shaking my hand. “This is the first time we’ve seen the sun in three weeks.” By then, winter had dumped 120-plus inches on the peak—50 inches in the previous three weeks. The superintendent and two rangers bunk in three rime ice-encrusted cabins at 6,200 feet. The buildings hum all winter in the constant wind. Other employees commute from their homes in the valley, which is why keeping the road open is job number one. From N.C. 80, between Marion and Burnsville, the trip is 11 miles of parkway and five miles of N.C. 128 to the summit. When the road is clear and weather permits, Bradley does his best to facilitate park visitors. We took in our surroundings and then carted our gear across the parking area to the six-room barracks. The structure is a residence for a few rangers and summer seasonals, and it’s “can’t-get-home” quarters when commuting employees don’t dare leave. Downstairs, there’s a large living room and kitchen. We’d lucked out. That night, on-site staffers were celebrating Mardi Gras with a mega-meal, and we were invited. Employees plow during daylight hours seven days a week as needed using a huge front-end loader and plow-equipped dump and pickup trucks. The diesel fuel requires a certain mixture of kerosene to keep it from jelling in the cold. “If we delayed plowing long enough to let a wet snow turn to ice, we’d have to cross plow back and forth with the loader one scoop at a time to break it up,” explains Bradley. The duties also include removing downed trees. Snow often mixes with freezing rain, which means that parking areas, trails, and even the road can become blocked. Also, the rangers stand ready to react if hikers are reported lost or overdue, but those occasions are relatively rare because the adventurers who brave Mount Mitchell in the winter tend to be experienced and well-equipped. The morning after our Mardi Gras celebration, we set off on a cross-country ski tour to the summit. As we climbed, we watched the front-end loader pile snow into massive mounds. We skied and snowshoed up the new, icicle draped summit ramp. I looked down at Elisha Mitchell’s grave. I have nothing against Mitchell—anyone who risked and lost his life on a virgin-forested mountain striving to accurately measure a peak in the mid-1800s deserves credit. But somehow, it seems more appropriate to bestow a name like Mount Washington, the highest in New Hampshire, honoring a man for measuring the potential of a people. As we gathered on the summit, clouds leapt over the windswept ridge like sheep in an insomniac’s count. Hoar frost stood out in feathers from every surface. The plaques at the peak and Brown oriented us to the surrounding white world before we had big fun skiing down the wide ramp from the summit. Near the parking lot, we plunged between snow-choked spruce trees and floated down into waist-deep powder—the only reason it was even possible to ski this steep, wooded section of the Old Mitchell Trail. Later, as I stood lost and momentarily frozen in the bitter cold and near darkness I recalled Blevins’ comment—this was beautiful, powerful, even intimidating. By now, my skiing friends were long gone. With no time to waste, I quickly aimed my adrenaline at a solution. No longer sure which direction to go, I spun my fanny pack around front, squeezed the tiny flashlight on my parka zipper and peered at the compass dangling on my pack. I knew the Black Mountain range trends northeast. I shortened my trekking poles to ice axe length, stepped up to the white wall of evergreens, dropped to my knees, and ducked under the lowest bows in a cascade of snow. After careening through the dark for 20 minutes, checking my compass often, and occasionally falling into tree trunk pits, I broke through. My feeble beam revealed the stone wall of the restaurant. Heading back to a warm barracks in my car, I reconsidered the name Mount Mitchell. After pondering an unexpected night exposed to the East’s highest elements, I concluded that it was understandable to name the peak after a man who took a walk in these woods and never came back.